Download the most recent map and mod ZIP files from the files tab. Unzip the ThoughtsInChaosMaps file into your StarCraft II/Maps folder and ThoughtsInChaosMod file into your StarCraft II/Mods folder. Open ThoughtsInChaos/MapLoader.SC2Map, then click the Test Map button. Save your game, then begin playing! We've done our best to test these maps, but no product survives first contact with the users. If you encounter any bugs, please report them in the issues tab. We'll try to address issues as quickly as we can. Need to catch up on the story? Thoughts in Chaos wouldn't have been possible without the tireless work of countless people. Please check out the Team Antioch and Voice Cast pages for the complete credits. Chaotic Thoughts #2: I have been Framed! Chaotic Thoughts #5: Are You Ready to Rourke? Is there a credits section here, or is it only in-game? It's currently only in-game. I was realizing I should pull it out into a page here. That's going to be kind of complicated, though, so it might take me a couple days. Added links to the team and cast in the description. Interlude 1 - Taught Gurney the correct spelling of Mad Dog's name. Who is Mad Dog? We can say this much: he's mad, dog. 3-0 - Despite the Protoss's inherent sense of melodrama, we no longer pause the action while they have their say. 3-0 - In the interest of creating a welcoming environment, we now add the Brood Fathers to the unit selection when they arrive on the scene. 3-1 - Added beacons to clarify for Moloch the exit of each area in the caverns. 3-4 - Upgraded hangar probe AI so it no longer suffers fatal pathing errors. 3-5 - Rescued Haley from an alternate reality in which she had more to say during the camera room cutscene. 3-5 - Newly emboldened, the computer no longer hides under Haley's hero icon during transmissions. 3-6 - Repeatedly ordering Khrillian to move no longer overcomes his normally considered approach. Jepok's AI in Sins of our fathers needs a tune-up. Standing in lasers targeting him, moving into lasers targeting another object.... this mission would be easier if I could control both of them, if only so i can keep him out of red. Also, one of the eyes decided to move to the center of the arena soon after a defeat reset... killed jepok on the high ground quickly. Sevorak also decided to join us on high ground once. One of the high ground phases lasted a lot longer than usual, 2-3 minutes or something. The pauses whenever a hero falls in the first segment is a terrible idea. "but if Mod Dog's right"
Something is wrong with Moloch's whirlwind, you can make it do a lot more damage than it should by using move commands during it. Consider placing beacons to allow players to know exactly when the area switches, allowing them to search the area for bonuses without worry. There's a certain order on the probe puzzle that can cause no restart to happen (targeting 2nd last, FF's last). What sort of confusion are you experiencing when you say "the 4-DT door beacon pairings can lead to confusion?" Also, what difficulty setting are you playing? As for difficulty, I'm playing hard on faster speed of course. It came as a shock how easy the holdout was. Figuring out which pair of beacons open a door can be a pain. Even more so in that section when the pair are not in the same room AND theres another pair that opens the same door. As for the first terran mission (the prison break), the gameplay feels tacked on so that there's more time between story segments. Make it slightly more clear which one of the 3 orbs you want us to click on first. Was any of this tested by someone w/o clear knowledge of the UI? Edit: clicked on the one that does campaign progress first. Edit 2: Is the confirmation window really necessary? Edit 3: Times are not being saved. Should be something making it a bit more clear in the next day or two ... don't think we had anyone test it that wasn't a dev, so we all kind of knew which to click. Whoops. edit: you want to watch the interludes first, then move on to the campaign, though the interludes are back story that takes place between episodes 1, 2 and 3, so I guess could be watched any time? I think that if you want to watch things in chronological order you need to play episode 1, interlude 1, episode 2, interlude 2, episode 3. And after a brief hiccup, we're back online. I hope you all enjoy playing! 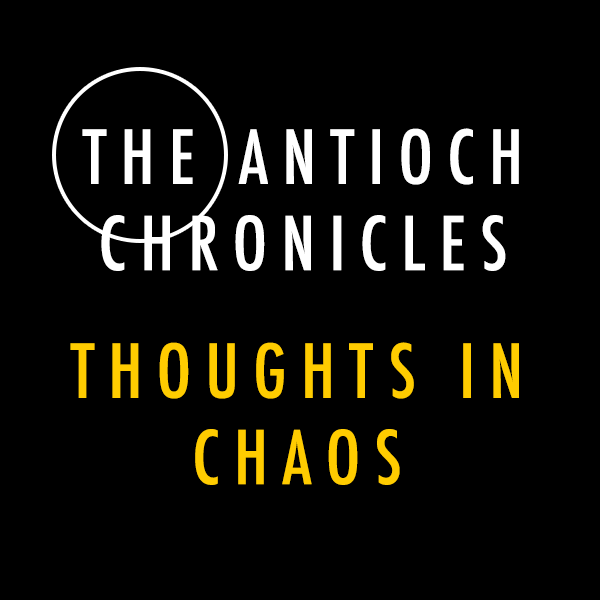 Team Antioch is proud to announce that Thoughts in Chaos v 1.0 is now available for download! Thank you to everyone for your patience. Check out our launch trailer! Thoughts in Chaos is coming in May! Oh crap! We forgot to post a link to our most recent update: Chaotic Thoughts #6: Better Times! Now why would we need this? Dun DUN DUN. Hype train. Just wait until our next big reveal! Coming Soon(tm)!